In what it described as attempt to elevate the status of the federal workforce, the Trump administration on Thursday proposed a massive reorganization of the Office of Personnel Management. The White House released its long-awaited reorganization report, which follows the executive order the president signed last spring and subsequent agency guidance from the Office of Management and Budget. It proposes a wide variety of moves, transfers and consolidations of departments, agencies and subcomponents across government. Perhaps most notably for federal employees, the administration proposes a significant shift of OPM’s existing functions to other agencies in government, as Federal News Radio previously reported. In its reorganization report, the administration painted OPM as an organization comprised of a chaotic array of functions — and as an agency that’s been distracted by a series of high-profile data breaches and investigative backlogs. Currently, more than 80 percent of the OPM workforce and funding is dedicated to processing federal employee health and retirement benefits, security clearances and managing USAJOBS.gov. Specifically, the reorganization report suggests moving OPM’s current “employee services” offices, which include employee relations, merit system accountability and compliance, hiring and other human capital functions. They would move to a new entity within the Executive Office of the President. This office would develop specific workforce policies, procedures and incentives across government, while modernizing the current approach to human resources policy, senior talent and leadership development and “total compensation and employee performance,” the report said. 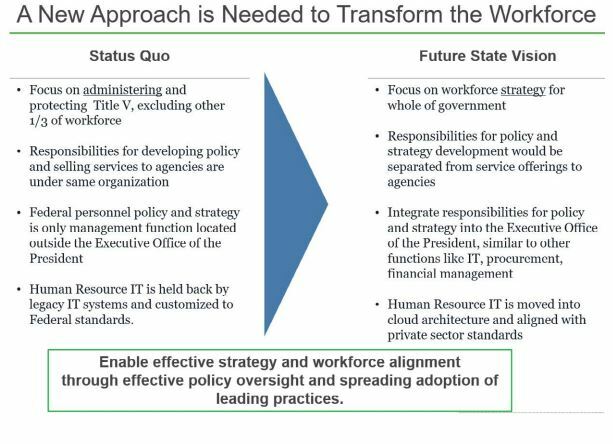 The new EOP office would centralize human resources policy for the entire federal workforce, while focusing on the administration’s efforts to modernize the current civil service. The Senior Executives Association praised the idea, likening the office to an executive-level human capital function within a major corporation. “The added emphasis on OPM’s core functions of providing human capital policy and oversight solve many problems that have for nearly two decades plagued federal human capital processes and practices,” SEA President Bill Valdez said in a statement. The Government Services Agency would maintain GSA’s existing functions and absorb OPM’s current transactional, service-based services, like retirement and health care. OPM currently administers health and retirement benefits to more than 2.7 million active employees and nearly 2.6 million annuitants, survivors and their family members through the Earned Benefits Trust Funds, which have close to $1 trillion in combined assets. HR Solutions, which currently offers products and services to help agencies with their human resources needs, would also move from OPM to the newly renamed GSA. In addition, the administration proposes a transfer of the entire governmentwide security clearance portfolio, currently housed within OPM’s National Background and Investigations Bureau (NBIB), to the Pentagon. The Trump administration has long considered this transfer, particularly after Congress authorized the Defense Department to begin a three-year plan to resume responsibility for all defense-related investigative work. DoD would serve as the primary governmentwide security clearance provider, a responsibility OPM held since the Pentagon first gave up the program in 2005. OPM currently charges agencies fees to conduct background investigations and provide HR services, such as staffing and hiring assistance. But the Trump administration sees these business operations as a conflict of interest. The administration’s proposal leaves several open questions, a point that OMB was quick to acknowledge. this proposal,” the report reads. 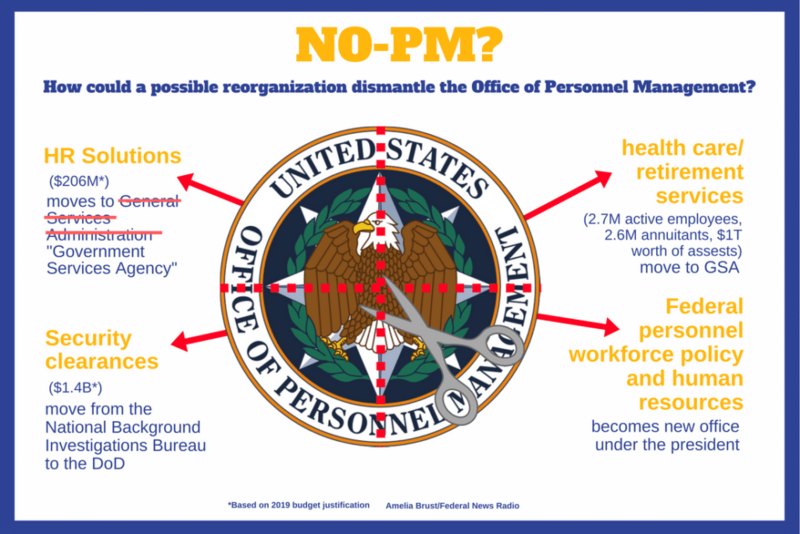 The future of OPM’s current leadership is also in question under this proposal. Though the administration’s report doesn’t explicitly say the agency would be abolished, OMB suggested transferring practically all of OPM’s current functions. The report also tasks both the OMB and OPM directors with the change-management and capacity building process to set up a federal personnel office within the White House. In addition, the OPM director would retain the responsibility of the governmentwide suitability executive agent,” who manages policies on whether employees and contractors are “fit” to serve in government. Weichert said the administration’s broader reorganization efforts are not an attempt to cut federal jobs. In addition, finalizing these moves would require both congressional action and administrative actions, the report acknowledged. Congress authorized OPM as an independent agency in the Civil Service Reform Act of 1978. The 2018 omnibus, which which Congress passed in March, appears to complicate the Trump administration’s reorganization initiatives by prohibiting agencies from cutting or eliminating specific programs or offices without approval from lawmakers. At the same time, Weichert described the proposal to elevate OPM’s human resources functions and transfer the security clearance program as moves the administration could do today. The House Oversight and Government Reform Committee has a hearing scheduled on the administration’s reorganization report for next week. The president’s reorganization proposals so far have earned mixed reviews from Congress.